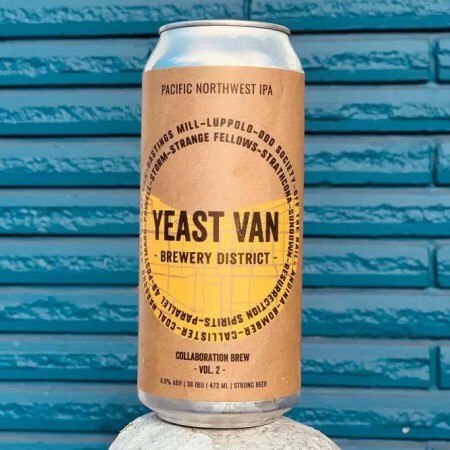 VANCOUVER, BC – The brewers and distillers clustered in an East Vancouver neighbourhood that has become known as the Yeast Van Brewery District have announced the release of their 2nd annual collaborative beer. Yeast Van Brewery District Collab Beer Vol. 2: Pacific Northwest IPA (6.8% abv, 38 IBU) was brewed at Bomber Brewing with assistance from Andina, Callister, Coal Harbour, Doan’s, East Van, Hastings Mill, Luppolo, Odd Society Spirits, Off the Rail, Parallel 49, Postmark, Powell, Resurrection Spirits, Storm, Strange Fellows, Strathcona, and Sundown. Described as being “hopped with Comet, Cascade, Centennial, and Chinook for a nice fruity and floral aroma and taste,” the beer is available now in 473 ml cans at Bomber and select private liquor stores. Partial proceeds will be donated to local food banks.